Deal Bindaas brings to you this exciting range of tricycles, rideon cars and more accessories for kids. This rid>on car is a fantastic companion for the child"s first explorations. It is a fun packed ride that features movable steering with effortless forward and backward movement. No extra torque or force is required while moving this car. 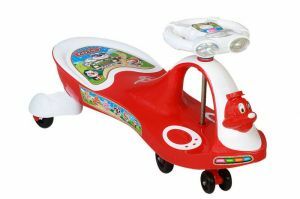 This car provides a comfortable and luxurious outdoor fun playtime for your dear kids.Fantastic companion for your child"s first exploration.No Torque or force required while moving.Wheeled riding toy for sufficient balance. >Wheeled riding toy for sufficient balance. The kid only have to move Steering for just 60 to 120 degree And it will move. Just give some time to start and play with the car . You will love the move and car . Brightly colored and visually appealing, these Swing/Magic car from the house of Dealbindaas Rideon help encourage play and improve coordination in kids. Helping your little ones grow independent, these Swing/Magic are safe as well as enhance arm-leg coordination.